Spreading their path of destruction to New Zealand shores for the first time, come Aura Noir. 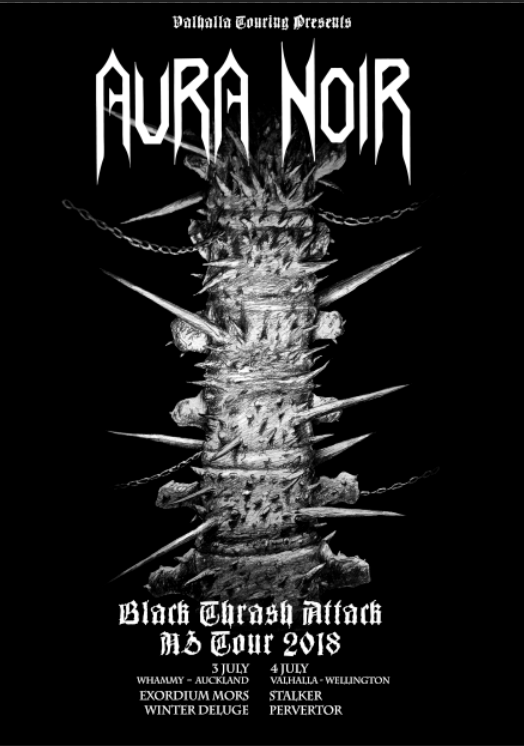 Aura Noir, the creators of what would then be called black thrash metal, came together in 1993 as a result of Aggressor and Apollyon’s disappointment with the metal underground trends, the overused use of keyboards, and the beloved productions, Aura Noir came as another unholy poisonous wind to regenerate a sterile and indifferent scene. Blasphemer joined in 1996 to contribute to the first full length album and the line up has not changed since. Influenced by visionaries of the 80s such as Sodom, Celtic Frost, Venom, Voivod, Dark Angel, etc. they felt that this void on the stage had to be somewhat supplemented by the entry of new bases and so black thrash metal was born. Together with bands such as Gehennah, Inferno and Nocturnal Breed, Aura Noir was found in the ramparts of a new wave in the metal underground, the school of the dirty thrash dirty. The band has released 5 studio albums. Most recent due out April this year.